Lambda School, a for-profit online coding boot camp based in San Francisco, announced today that it has raised $30 million in a Series B funding round from a group of venture capitalists led by a former protégé of billionaire Peter Thiel, Geoff Lewis of Bedrock Capital, in addition to Google Ventures, GGV Capital, Vy Capital, Y Combinator and actor Ashton Kutcher’s Sound Ventures. The round brings the total capital invested in Lambda to $48 million at a post-money valuation of $150 million. Among the glut of unaccredited coding schools, Lambda stands out for two reasons. It has no campus, so each of its more than 1,000 students takes courses online. Second, it allows students to pay for its 30-week software engineering courses with an increasingly popular arrangement called an income share agreement or I.S.A. Students can either pay $20,000 in tuition up front, or opt to pay zero in exchange for signing an I.S.A., which obligates them to pay 17% of the salary they earn from a job that pays at least $50,000 annually for two years. Lambda caps the I.S.A. payment at $30,000 and if a student doesn’t find a well-paying job within five years, she owes nothing to Lambda. The arrangement is controversial because I.S.A.s are, as yet, unregulated, though there is legislation pending in Congress that would impose federal oversight. For two years he ran a venture-backed startup from the small town of Ephraim, Utah, but the company, an attempt to build a Wikipedia-style site for fact-checking news, failed. 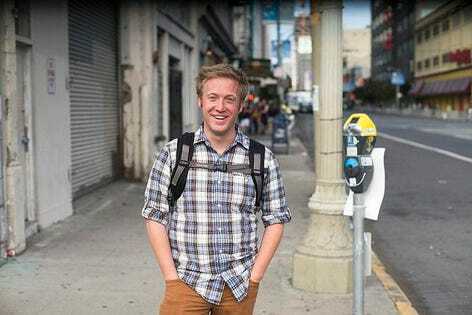 Next, he got a job on the growth team at a San Francisco-based online lending company called LendUp. The contrast between jobs and salaries in San Francisco and Utah led him to the idea for Lambda. “My friends in Utah were just as smart as my friends in San Francisco, but they didn’t have a path out,” he says. He teamed up with a fellow BYU drop-out, Ben Nelson, 27, who had gone through a coding boot camp, and the two started Lambda in 2017 with a free online one-month introduction to computer programming course. Seven thousand people signed up. Next, they started charging $10,000 for a 12-week course, but not many students enrolled because they couldn’t afford the fee. So Allred and Nelson tried offering the course for a $1,000 up-front payment, with the remaining $9,000 due once the student had landed a job and started earning. More than 100 students signed up. “We realized we had stumbled on something by de-risking the education,” says Allred. The next logical step, he says, was introducing income share agreements. With a new business plan, he and Nelson were accepted to Mountain View, California startup incubator Y Combinator, which came with $120,000 in funding. Next, the founders raised a $4 million seed round in October 2017 and a $14 million Series A the following year. Lambda, an obscure name Allred says he chose because it is a term he liked that describes a form of mathematical logic, draws most of its students from a low-earning demographic. The average annual income for Lambda students when they enter is $22,000, says Allred, and the average Lambda graduate increases his or her income by $47,000. Lambda’s staff of 50 full-timers and 110 part-timers includes eight career coaches who have helped 83% of Lambda grads land jobs at companies including Google, Amazon, United HealthCare, Best Buy, AT&T, and Verizon, says Allred.